David Tickner is a writer and former college teacher. The phone rang. When I picked up, my ninety-year-old mother, without any preamble, insisted that I should go and turn on my TV. “There’s a program on about your grandfather,” she said. I asked for details. What channel? What program? Unfortunately—but not surprisingly—she wasn’t able to give me any further information. “It’s a program about your grandfather in the war,” she insisted, as if the program would just be there when I turned on the TV. I should mention that it was Remembrance Day. Trying to clarify, or so I thought, I asked her if this was a program about Vimy Ridge, the battle in which my grandfather had been wounded. My incredulity strained as Mum described how she’d seen his name on the TV. I have to admit that I thought Mum was losing it; nevertheless, my curiosity was aroused. I didn’t need much encouragement to put aside a stack of college student assignments I was in the middle of marking and check the TV listings. Mum had been watching a documentary titled Vimy Underground on the History Channel. Mum, bless her heart, was right—my grandfather was indeed featured. Vimy Underground describes the souterrain—a network of caves and tunnels dug into the hard chalk forty to sixty feet under the fields leading to Vimy Ridge. These caves, some of which date from medieval times, were used as a base and staging area for Canadian soldiers. While waiting and resting there in the days and hours before battle, many soldiers had carved graffiti into the cave and tunnel walls: names and dates, images of people at home, images of pets and farm animals, hearts (Bill loves Mary) as well as quite detailed and complex bas-relief carvings such as battalion crests. As I watched, I saw that one depicted the 16th Canadian Scottish, my grandfather’s battalion. I was startled to see the name “J. Cameron” carved beneath the crest. And then a set of words appeared on the screen: “John Cameron. Age 31. Moulder. From Manchester. Survived the war.” John Cameron—my grandfather. John Cameron was born on March 24, 1886 in Aberdeen, Scotland. For reasons long lost, he and a sister were sent as children to Manchester and brought up by an aunt. He became a moulder, married Florence Stansfield, and had two children. In 1910, they immigrated to Canada and eventually settled in Brandon, Manitoba, where he worked for the local machine works. When he returned from the war, his job had disappeared and he spent over a year unemployed until he found a job as an electric-meter reader for the Manitoba Power Commission (now Manitoba Hydro)—a job at which he worked until he retired. He and Florence had two more children, one of whom is my mother, Jean. What do I remember of him? I liked him. I remember him with affection. He would take time to read and play with me and my younger sister and brother. He was funny. He taught me a sleight of hand magic trick that even now I use with my own grandchildren. I’d liked to watch him lather up and shave in the mornings after vigorously stropping his straight razor. And, to my surprise, he used tooth powder instead of toothpaste, the smell of which I can still conjure up. I remember the disdain and disgust in his voice when he spoke of bully beef—he wouldn’t go near it. I liked tinned bully beef, a cheap and easy meal on our table. I was puzzled by his dislike of it and only now realize how much bully beef must have reminded him of his life in the trenches during the war. On September 22, 1915, he enlisted in the Queen’s Own Cameron Highlanders of Canada, units of which were later joined with units of other local militia regiments to comprise the 16th Canadian Scottish Battalion of the Canadian Expeditionary Force. He was twenty-nine years old. On June 28, 1916, the Battalion arrived in France in time to participate in the calamitous fighting in the Somme River valley through the summer and fall, particularly near Thiepval Ridge and Courcelette (Regina Trench). That winter, he was promoted to Lance Corporal and put in charge of a section of men. 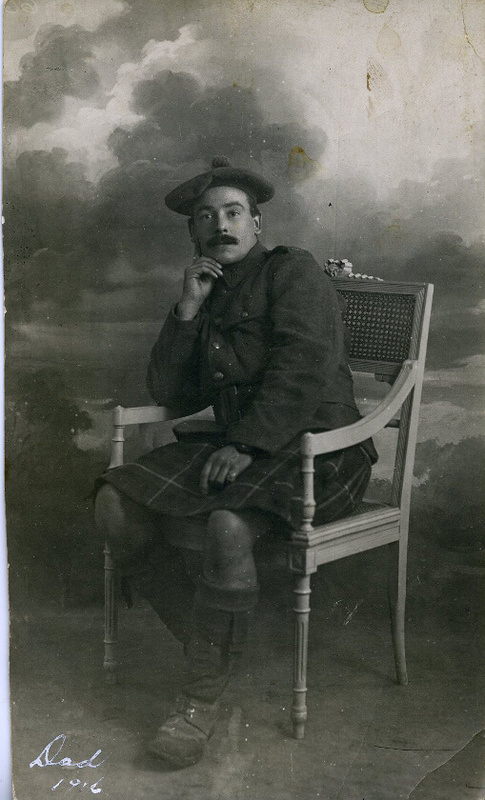 A 1916 photograph shows a young man seated casually on a chair in a photographer’s studio wearing a kilt, tam, and a military jacket into which it seems he has shrunk, his boots stained with mud and watermarks. His chin rests easily on his right hand. His eyes look thoughtful and weary. On April 9, 1917, during the assault on Vimy Ridge, he was struck in the neck by a piece of shrapnel. Three days later, he was evacuated to a hospital in England. He remained in a Reserve Unit in England until December. He was ‘Struck off Strength’ a couple of months later and presumably returned to Canada with the 16th Scottish when the battalion returned to Canada on the RMS Empress of Britain in May 1919. He died of a heart attack in Brandon forty-five years later at the age of seventy-eight. I resolved to go to France and see my grandfather’s carving. I wanted to see the souterrain for myself—the challenge was to find it and get in. In addition to the vast network of trenches developed during the war across northeastern France, there was an almost equally complex system of caves and tunnels under the battlefields. In contrast to the trenches, which have returned to farmland or forest over the years or are preserved at various historic sites, many of the tunnels still exist much as they were left at the end of the war (some in greater states of collapse or disrepair than others). After several phone calls and email enquiries, I learned that the entrance to the gallery of caves and tunnels in which my grandfather carved his crest was on private property at a farm called Maison Blanche, just north of Arras on a country road not far from Vimy Ridge. Entrance to the Maison Blanche souterrain requires permission and a guide. My search for access to the souterrain led to the Durand Group—a British association of volunteers comprising retired and current military personnel as well as historians, mechanics, archaeologists, and other professionals, including bomb disposal experts. During the 1980s and 1990s, at the request of the Canadian government, the Durand Group located and defused several unexploded mines that had lain dormant under Vimy Ridge since the First World War. More recently, members of the Durand Group have researched, located, and cleared many of the old tunnels under the First World War battlefields. They now conduct tours of these battlefields and the souterrain systems. My efforts to see my grandfather’s carving eventually led to Dave Hedges of the Durand Group, who had organized a battlefields tour for the coming summer. He invited me to join the group when they visited Maison Blanche. I started packing. Arriving in Paris, I picked up my rental car and drove north to Arras, the part of France that saw some of the bloodiest fighting in the First World War. I felt an increasing sense of dissonance and disconnection as I drove through the countryside. The picture that I had in my mind’s eye of the Somme battlefields did not seem connected to where I actually found myself. My head and my body felt like they were in two different places. The quiet pastoral landscape through which I was driving bore no resemblance to the scenes that had been created in my imagination over the years by countless books, photos, and old wartime film footage—the sepia-toned fields of mud and rain and shattered trees and torn up earth, wrecked carriages and dead horses, flattened villages, ruined cities, and columns of gaunt, exhausted, stare-eyed soldiers. My senses kept trying to tell me that I was driving across Saskatchewan where I had grown up—flat farmland stretching to the horizon in every direction, big red farm tractors working the fields, combines harvesting ripened wheat, and a general feeling of ease and prosperity in the farms and villages through which I passed. Of course, instead of the big orange grain elevators once seen in every prairie town, medieval church spires rose above the rooftops of every village. But finally the military cemeteries cut through the dissonance I had been feeling. There were large and small cemeteries; cemeteries beside major highways and at the junctions of country roads; cemeteries in the midst of and at the corners of farmer’s fields; cemeteries where men had been hastily buried near where they had fallen. The Commonwealth War Graves Commission has made a determined effort to ensure that every death is remembered. Each grave is uniformly represented by a white stone marker. Each marker records a man’s name and regiment, date of death, and sometimes words of hope and comfort provided by his family. At every cemetery, usually in the entrance gateway, two binders have been placed in protected niches—one binder naming the men buried in the cemetery and a second book for visitors to sign and comment. I stopped at several of them. Walking through them, I felt sadness at the loss of life—each life, each name. And anger—but anger at what? At who? The politicians? The generals? History itself? No amount of reading or preparation could have prepared me for what I experienced while visiting these cemeteries. Even just driving by one left me unsettled. I felt it again the day I visited the Vimy Ridge National Historic Site. The 1917 battle for Vimy Ridge, one of Canada’s costliest military victories, was achieved at the loss of 3,598 dead and more than 7,000 wounded, including my grandfather. Very little of the battle remains. Trees cover the ridge, which during the war was shattered by the unrelenting artillery fire before the fighting. Mechanized grounds-keeping equipment can still set off unexploded ordnance buried on the grounds, so sheep quietly graze on the grass which has grown over the trenches and craters which have long since fallen in on themselves. The day was cool and overcast, threatening rain. I parked the car, and instead of taking the path directly to the memorial I took the longer path around the perimeter. As I began to walk toward the site, the sun broke through the clouds behind me and flooded the memorial with light, illuminating the white limestone against dark purple clouds filling the sky. The memorial is stunning but surprisingly simple—two towering pylons rise serenely from a pedestal base of thousands of tons of concrete and steel, all of which is faced with white limestone. Inscribed on the walls and panels are the names of the 11,285 Canadian soldiers killed during the war who have no known graves. Carved human figures bring drama to the flat planes of the base. A grieving mother and father confront the visitor ascending the stairs from the ground to the base of the memorial. A chorus high on the pylons represents universal virtues of charity, faith, honour, hope, justice, knowledge, peace, and truth. Between the pylons, a figure representing the spirit of sacrifice breathes his last as a defiant torchbearer rises above him. In one tableau, a group of people pauses beside a kneeling man who is breaking his sword. Another tableau represents sympathy for the helpless. At the front stands the solitary statue of a grieving mother, her back to the memorial, gazing downward on the plain below. The power of this memorial and any other of equal art arises not only in its capacity for commemorating the past, but also by making it possible to let the past go. The awe and sadness and sense of waste that the Somme and Vimy evoke etch channels of emotion in which memory is nurtured and grows. I could not help but think of other places in the world where war and conflict carve rivers of hate and outrage in the hearts of those involved—memories, emotions and stories that pass through the generations, nurturing future turmoil and hostility. Perhaps the Vimy Memorial tells us that we do not have to be limited or haunted by the tragedies and injustices of the past. We can, if we choose, let go of our anger—even let go of the anger passed to us by parents or grandparents, by history or tradition. I purposely saved my visit to the Maison Blanche souterrain until my last day in Arras. The afternoon was bright and sunny and warm. I had been told that the farm was across the road from a German war cemetery—the largest German cemetery in the region. During and after the war, German dead from battles in the area were collected and reburied here—44,830 men—creating rows and rows of black crosses stretching through the trees as far as the eye can see. The entrance to the cave was just a dark hole in the ground behind the farmer’s barn. Surrounding the entrance lay a cement frame attached to a rusty red-brown steel door. An orange electrical cord ran from a small red generator into the opening and down a rough staircase made of sand bags and large stones so that our tour group, clad in hardhats and wielding flashlights, would have electric light as we made our way underground. We lined up and descended the stairs to a depth of about forty feet, holding onto a rope banister. As I descended and then bent over to get through the narrow passage, it felt like a religious ritual—a descent, the bowing down once in the narrow passage, and the emergence into a sacred grotto. We entered a wide, high-ceilinged space full of light cast by bulbs dangling from makeshift hangers fastened along the walls. Dave Hedges of the Durand Group led us through the caves, pointing out the various bits of graffiti. We looked at the ‘post box’ that had been carved into a wall—it had actually been used as a post box during the time the men were in the caves. We saw self-portraits of medieval masons who had carved their images into the entrances of various caves in order to mark their work sites. Our flashlights cast vague purplish patterns and shadows as we walked. Hundreds of different pieces of graffiti carved or scratched in varying degrees of skill and complexity covered the walls. Even a simple name carried power. As the soldiers rested, they carved pieces that were both artful and ordinary, intentional and casual, remembrances of home and loved ones, images of people and animals, of peace, full of the intensity of life and of being alive. The 16th Scottish Battalion was billeted in the Maison Blanche souterrain just behind the front lines between March 24 and 30, 1917. This period is likely when the men would have had the time to create their graffiti and carvings on the cave walls. Between March 31 and April 5, the battalion was moved back well behind the lines to a reserve position. On the fifth, in preparation for the battle, one of the battalion’s four companies moved to the Bentata Subway, one of many tunnel systems created over previous months to give soldiers some protection just before the attack. Two companies returned to Maison Blanche, just behind the Bentata, and the fourth company of the battalion remained in reserve. In the early morning hours of April 9, Easter Monday, the men of the battalion moved forward from Maison Blanche and followed their comrades already moving through the Bentata Subway. I tried to imagine that morning as these young men picked up their gear and weapons and walked single file down the narrow tunnel, walking toward that moment when they would break out into the open and move toward their attack on the German lines. I thought about my grandfather. He emerged from the Bentata Subway that morning, and as he walked head down toward the enemy into a storm of flying metal, one of the millions of pieces whirling through the air hit and knocked him down. My grandfather’s presence in these caves was on my heart and mind as I walked through the souterrain with the others of the group. Eventually, Hedges turned to me and said so all could hear, “So, are you ready to see your grandfather’s carving? Can you find it?” In fact, I had already recognized it off to the side of where we were standing. I felt a momentary sense of nervousness mingled with awe as I walked over to my grandfather’s carving of the 16th Battalion crest and said a quiet hello. The carving is relatively simple. At the centre is an ‘X’ overlaid by a ‘16’ almost as large as the ‘X’. The ‘X’ sits on a ribbon inscribed with the battalion motto, “Deas gu cath” (“Ready for the fray”). A crown rests atop the ‘X’. All of this is set inside a simple niche with a flat bottom and rounded top. 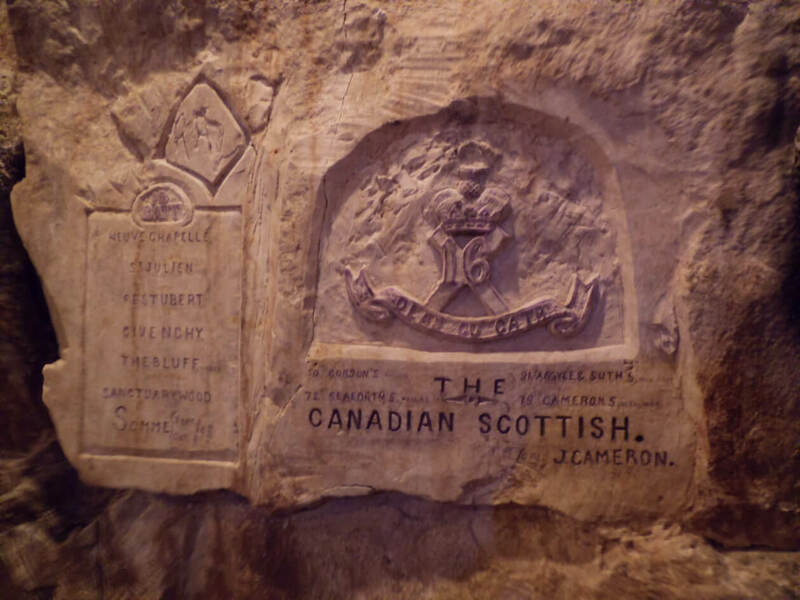 Under the niche my grandfather inscribed “The Canadian Scottish” in block letters and the names of the four units that made up the battalion. To the left of the crest, he carved a simple plaque in the chalk with the names of the battles in which the battalion had fought so far: Neuve Chapelle, St. Julien, Festubert, Givenchy, The Bluff, Sanctuary Wood, Somme. And his name, “J. Cameron”. As I stood before his carving, I wondered why he had chosen to carve his battalion symbol. What was on his heart and mind as he waited for battle? What urge impelled him to spend hours carving this image? My grandfather would have been sitting on the edge of his bunk as he carved. Below the carving was a larger niche that had served as a bedside shelf, on which, still there after all these years, rested an old matchbox, the bottom of a grenade that had been used as a candle holder, some half-burned papers, and several rifle bullets covered with mold. The chalk wall was still smudged with candle soot. Pieces of chalk on the ground at the bottom of the wall felt damp and glue-like from the humidity in the cave. Others in the tour group seemed moved by my pilgrimage to see my grandfather’s carving. One fellow came over and asked me how I felt to be here. “I guess you’re pretty emotional,” he said, somewhat emotional himself. One of the women gave me a polite British hug and asked if I could feel anything of my grandfather’s spirit. In fact, I was surprised by my response. I felt a sense of achievement, wonder, and amazement that I was now in this space which so many years ago had contained men facing life and death. Yet I knew that whatever emotion I felt paled in comparison to what I imagined that these men would have experienced. Being there was about my paying my respects. Hedges came over and quietly asked if I wanted to spend a few minutes alone with my grandfather. I nodded my assent. He said to come back to the surface when I was ready. He called the others, and as they left to go back up the stairs, he told them I would remain behind for a short while. Being left alone like this felt somewhat strange, even awkward. The thought that there might be something I ought to be doing or feeling passed through my mind. I was so aware not only of my grandfather’s life in this space but also of how many others this cave once contained. For a few minutes, I just stood before my grandfather’s carving in the impressive quiet of the souterrain, resting in the moment, recalling memories, and thinking of him. I did not feel sad; I felt fulfilled, in fact, and full of life. My grandfather had gone to war—and unlike so many of his comrades, he had survived. And for his life, and for his comrades, and for my own life, I am grateful. Six months later, my mother had a stroke. While clearing out her apartment after her move to a care home, I found a small box at the bottom of her bedroom closet. Inside, pinned to an old piece of green-blue tartan, was the tarnished metal cap badge of the 16th Scottish Battalion. It was the model for my grandfather’s carving at Maison Blanche.